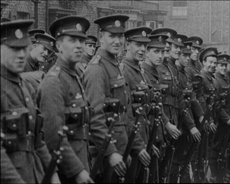 As the Centenary commemorations in 2014 approach, the Yorkshire Film Archive (YFA) is delighted to announce it has received an award from the Heritage Lottery Fund (HLF) for an important new project, Filmed and Not Forgotten, that will enable vital preservation work to its film collections relating to the First World War. Filmed and Not Forgotten will research and discover the stories of the people on films almost one hundred years ago – who was that sergeant waving at the camera as he marched over Lendal Bridge in York; what happened at the sports day in Scarborough when the regiments stationed there came together with the community for a day of fun away from the front line? All of these films, and the stories of the people in the films, will be brought together in screenings, and as an online exhibition so that everyone can see and learn about the impact of the First World War on communities across our region.